- Login to an Ebling Library InfoCommons iMac student workstation, using the Mac Operating System. - Click the MedSchoolPrint shortcut on the desktop. 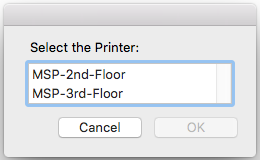 - Select the printer you would like to print to, then click OK.
A window will pop-up confirming your printer connection and page quota. - Make sure the correct printer is selected, in whatever browser, or application you are using. - Send your first print job, then open the print queue by clicking the (bouncing) printer icon. - To the right of the print job, click on the circular arrow button. 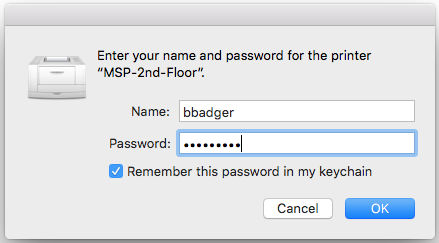 - Type in your NetID password, check the Remember this password in my keychain box, and click OK.
- The print job should now be sent to the Med School Printer, to be collected. Note: There are two Med School Printer locations. One is in the 2nd Floor Ebling Library Copy Center (room 2361). The other is at the end of the row of computer desks, on the 3rd floor along the atrium window side, closest to the historical reading room.